Merry Christmas to all you SOUL EV Owners! Heres the breakdown. I purchased the car a couple weeks ago from a dealership in NC and brought it back to Dayton, OH. It has 40,531 miles on it currently - I made sure all tires were property inflated a few days ago. 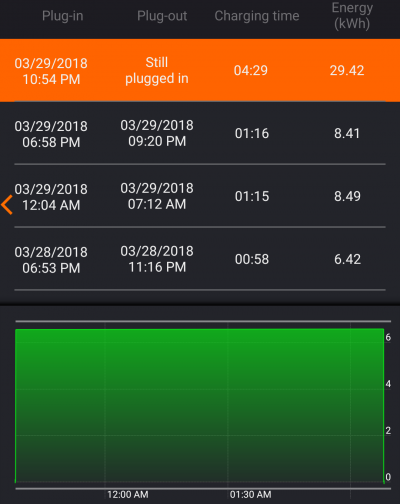 I can also post a screenshot from my JuiceBox Pro app with battery charging stats. Happy Christmas! Yes, please do upload your juicebox stats. However, we do need more data. Specifically, CED and CEC from torque pro. Then, do your range test once more and perform the calculations. Be sure to take screenshots before test, after test, and after recharging to 100%. = CEC (after charging) - CEC (before charging). That is a big part of your problem right there. When you drive a car with the aerodynamics of a brick, speed really affects range. Try 60mph. With our 2016 EV+ with nearly 54k miles the battery is at 98% SOH and in cold weather is getting only 75 miles range. Just today my wife drove to work an back, 65 mi, and arrived home with 8 miles range left. The temperature in the morning was in the low 30s F and low 40s F on the way home. This is with climate control set to auto at 74F. If she had driven 68mph she would likely not have made the round trip. There should be fewer Soul EVs being driven fast in the HOV lanes now. From many threads on this forum it seems the primary cause of battery degradation is long fast commutes. The Soul EV does really badly when driven fast. It was not designed for this purpose. But people were getting cheap 3 year leases to take benefit of the HOV access. And given the fact that the EV media hypes the fact that EVs can drive fast, most people probably don't know that fast driving is not sustainable . Sales figures for the Soul EV in the entire US via insideEVs. JejuSoul wrote: the primary cause of battery degradation is long fast commutes. If we're talking about the same CA here, then this isn't quite right. The average speed in HOV lane in CA during commute time is maybe 35mph, vs 15mph outside Weekends are another story. Thanks for pointing out my obvious mistake. If the HOV lanes were running smoothly, there would be no reason to limit the number of cars in them. We have some Torque data from that car. He is one of the regulars on the German forum. According to Google translate "" I have learned that not the whole "box" but only the battery packs are replaced,""
The screenshot on the previous post made me check some statistics from my old 2015 Soul. The interesting numbers are the Max and Min Deterioration Cell numbers. They show Max det #2 and Min det #8. This was indeed a great reading, I want to thank to all the participants. My car is a Soul EV from October 2016 and I bought it in the beginning of February 2019 with 16573 km on the screen. In the day I went to dealer to look on the car, I saw in the driving history on the infotainment system that the car has been driven almost every day until May 2018, then in the following summer and for 9 months it stood still with less than 100 km during that time. also took a few screenshots of the actual data in the time. For a future reference (this did I also with the Peugeot iOn I had before) my normal speed is 70 kph, 90 if i'm on the highway, cruising behind a truck; I ALWAYS use cruise control, everywhere. I drive on B mode, and I try to predict traffic, so no hard brakes, or full gas (except if i'm first in traffic light and the guy on the second lane thinks he has a fast car ). We have a week or two in the summer above 30°C, else it's 25°C for 2 months, the winter snows for maybe a week or two; so I assume we have a mild climate here in Belgium, near the sea, so always flat driving. I might drive 50 to 100 km on the weekend. During weekdays I charge the car everyday at 2am, automatically stopping at 80%, auto heater is on set to 20°C during maybe 4 or 5 months per year, half hour before I leave for a 6 km commute. Car is parked outside, on summer it goes under the trees for shade. End of the day 6 km back home. I have been reading about spreadsheets but can find none. Is there one I can have that already plots this info? I plan to take data 1 or 2 times per month and of course, share it with you guys. @JejuSoul will you share your spreadsheet? Than I'm sure I take the useful data and can set a Torque screen for that, and reserving the other screens for other occasions. I made on the last year on my iOn about 4 000 km, so definitely, my battery will not die by EV km, but for other whatever reason; age probably; and this car might be an interesting car to follow because of this. This is from I went to have a look before buy.